fertilizers depending on the soil composition , the needs of each area of ​​the field and the planned yield. The use of this technology, compared with the traditional background method, has more effectiveness. – Baryshivska Grain Company raised a new bar – we introduce a differential mineral fertilizer application. We started with our own databases. At present, the company has already compiled electronic cartograms for the differential application of mineral fertilizers in 65% of the fields. 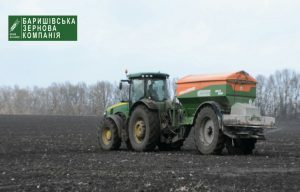 Baryshivska grain company acquired four new Amazone spreaders in the fall for loose mineral fertilizers with software for differential mineral fertilizer application. We will introduce new methods in four regions of the company – Southern, Northern Poltava, Chernigiv and Kyiv region. 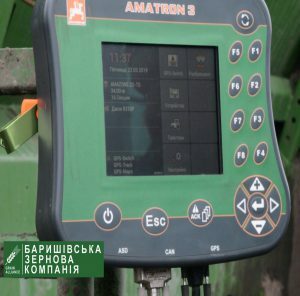 Along with the new technology, we need to train our employees, “said Andriy Grytsay, the Chief Engineer of the Agricultural Machinery of Baryshivska Grain Company. Representatives of the vendor company conducted a training at BZK inctructing workers how to set up Amazone bulk fertilizer spreaders. 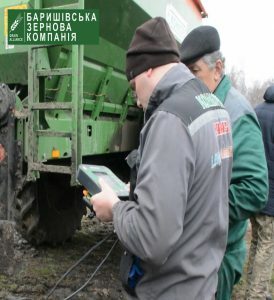 The practical part of the training took place in the field near the village of Voronki in the Chornukhino district of the Poltava region.